Parota is one of the famous A great street side food in Tamil Nadu and Kerala. Parota is, fluffy, soft circular breads made with plain flour or Maida. This parota has layers of thin crispy films and is very good to eat. 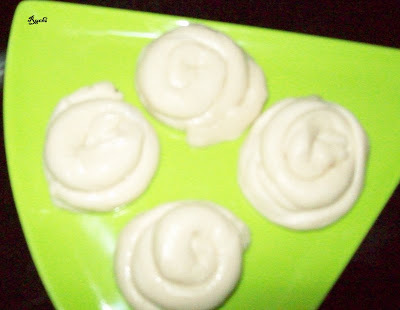 Traditionally this kind of parotas are made by repeatedly beating the dough that is prepared with optimum amount of warm water and baking soda Another alternative to heavy beatings is to make a thin film and then preparing the rolls.First of all, this item literally takes a bath in oil, so people who are health consicous better avoid making this dish. ( but I applied less oil).The other thing is , it takes atleast a couple hours to make these parottas, most of which is kneading the dough, beating and shaping. I tried it and it came out really well!! 1.Mix the all purpose flour, salt and warm water Knead the dough nicely and keep it aside for 1-2 hours. Cover it with a wet towel or a close it with a lid. 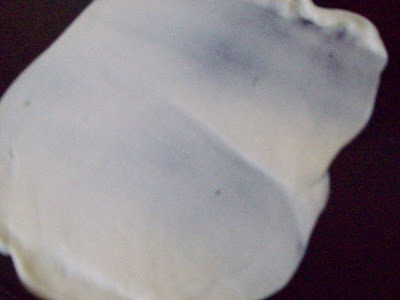 2.Check the dough whether you can able to expand it (as a chewing gum) easily. If it is so this is the correct stage to proceed further. 4.On a flat surface apply oil and roll the parota ball to the maximum stretchable layer. Make it as thin as possible in both length and width. Don't worry about the shape. 8. Now remove it from fire and tap it with both of your hands when it is hot Serve hot with any kind of kurma of your wish. 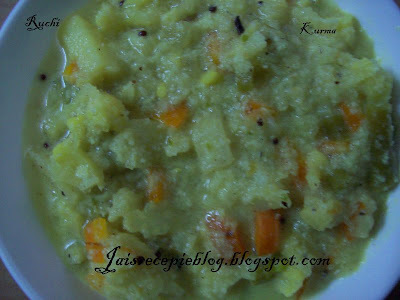 Kurma is always been a favorite dish for everyone and, everybody has their own way of doing it. This recipe is different from its north Indian cousin. Coming from the south and west of India, it differs a bit in the ingredients and method of cooking, which makes the end result totally different. Here come my style of doing it which is easy to cook and the same time very tasty. 1. Cut all vegetables into cubes.Wash then and put them in boiling water adding salt. Cook them and drain them. 2. Cut 1/4 th of the onion to long thin pieces and keep aside. 3. In a pan add 1 tsp oil/ghee add rest of the onion and fry them. Add garlic coriander seeds,clove cinnamon. 4. Grind them along with greenchillies,ginger,coconut andkhus khus. 5. In a pan add 1 tsp oil/ghee. Add the cut onions, and fry for 2 mnts and then add ground mixture. 6. Add the cooked vegetables. Add salt to taste. 7. Cook in medium flame for 5 mnts.The gravy should be semi liquid. Malar Gandhi ,Akal's Saappadu&Anu sriram has passed on the Good chat award to me. Thanks a ton for all of you for remembering me.I feel honoured. I am passing on this award to all my blogger friends who have been chatting with me and passing on their valuable comments :)Love u all. parotta and kurma looks perfect Jaishree. thanks for the recipe. As you said it consumes so much time and I am a lazy girl to make it. But will try it one day.. All the best for your students.. Your parotta and kuruma are really lovely. This is our traditional method. U got that flaky parottas too. I never succeded in achieving this result. Kuruma also looks yummy. Nice combo. Best wishes for you and your students. Expecting u back soon. Looks Delicious.... Parota is my all time favourite and with kurma it tastes heavenly... Enjoy ur award! Hi, How r u? Parota and kurma looks so good! Parota Kurma is my favourite. Pictures looks lovely. All the best to your Students. will see u back soon after ur vacation! Shree, its been a while I came to your blog too! Aah...I missed so much of goodies...will browse slowly. Yeah good that you used less oil. I too spray oil here to make those parotas. Making these at home will make us to crave less, when we are out! Looks super yum! You have nice blog here..nice collection of recipes! Parotta and kurma look inviting...congrats on your award...see you back after your break ! Parotta looks yummy and perfect..Will see you after your break and enjoy till that time..
parkavey supera iruke.. kalakunga.. looks perfect dear.. hope doing good there..
wow.. tasty tasty parotas... super. Thank you all my friends for loving comments and caring words. Deesha thanks for your compliments. Sameera so nice of you. Madu Thanks for dropping .you are welcome here. 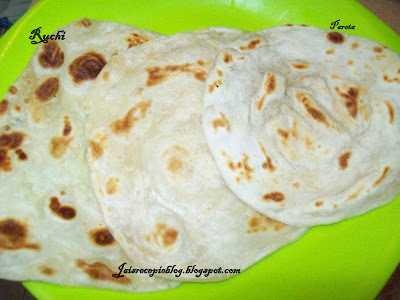 Looks delicious and parota looks flaky..Super Yum!..u have wonderful blog here! i tried ur parota kurmua. parota came out well for a first try. also kuruma was good. but i added more chillies and it was too hot. but for it i know ur recepie is a keeper. thanks a lot.